Reflect on how your style can help you and how it can negatively impact your culture and behavior. ​We have been building our R Factor behaviors in Hilliard City Schools for several years. My staff and I have been extremely intentional about teaching these behaviors to our students. This year is our second year of R Factor student training. As a building principal, it is fascinating to see how this training has impacted the culture of our school. I have written about the power of words many times. I truly believe in and value the impact that words have on others. This summer, I attended a conference in which Michelle Gielan, author of Broadcasting Happiness gave the keynote. During her inspiring talk, Michelle said three words that I will never forget. When I heard these words it was as if everything happening around me stopped and the weight of their meaning poured into my soul. 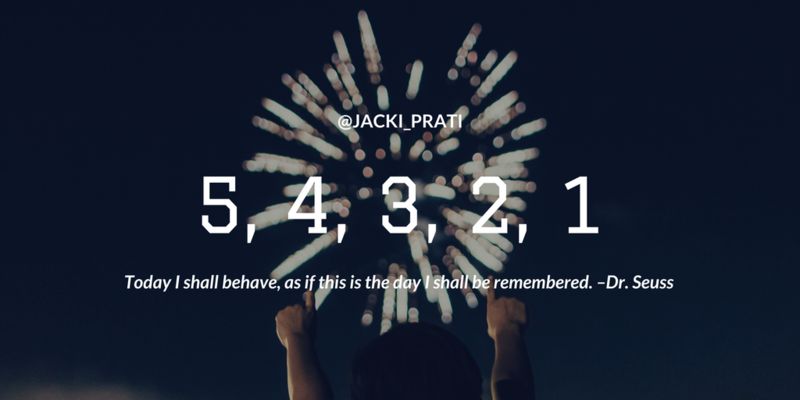 I didn’t even have to write them down because in that very moment, what she said forever changed who I was. When I say these words I can actually feel them inside of me. We often say, “be careful what you say”, or “words have an impact”. But, never had I considered that “words change people”. Not long after Michelle’s keynote I stood in the main office of my school greeting families and welcoming them on Meet the Teacher Night. I was helping answer questions about bus stops and teacher assignments and I didn’t pay much attention when the mom of an Arabic speaking student walked in along side of the mom of an English speaking student. I did notice that their children were laughing and playing side by side. But then I realized that the English speaking mother was carrying the other mother’s toddler for her. I soon discovered that these two moms had become friends over the summer because the live in the same neighborhood. And, to top is off the English speaking mother was using a translation app on her phone to talk to the Arabic speaking mom so she could help her navigate all of the beginning of the year forms that come with starting school. This story is heartwarming to say the least, but there is more to it. Just four months prior to this encounter on Meet the Teacher Night, I had another encounter with the same English speaking mom. Only this time she was expressing how uncomfortable and downright annoyed she was with all of the people in her neighborhood who couldn’t speak English. We had a heated and honest conversation. By the end of it I had convinced her that she should change her perspective about her neighbors and maybe try to meet some of them, bake them some cookies and welcome them to America. Yes, I actually said those words to her. She hugged me and said she appreciated me taking the time to talk to her without judgment. Needless to say, I chalked that up as a great day and would have been happy for the story to end there. Little did I know that in just a few short months, I would find this same mom taking another mom, one who didn’t speak English, under her wing. I’ve written this post for one reason and one reason only, to remind myself and everyone who reads it that words really do change people. Our words are more than just heard and forgotten. Our words stay long after we’re finished saying them. ​Our words change people. How do you choose to use your words? ​What do you do when things don’t go your way? Do you blame others? Do you complain? Do you defend your actions? This time of year in education is always a time of change. The addition and subtraction of sections at certain grade levels; teachers retiring or moving to new positions; and course offerings changing usually create feelings of discomfort. Sometimes the changes that we are faced with are not ones we wanted or planned for. And, let’s be honest, teachers love a good plan. Often, when that plan doesn’t go our way, we don’t like it. I’m guilty of not liking certain changes. No matter how much I push myself to think differently, embrace the journey and dream big; sometimes when change doesn’t go my way, I get upset. But, just like you, I have a choice. Will I stomp my foot and throw a little fit…sometimes I will. (I’m not proud of it.) But, will I allow myself to hold on to those feelings and continue to blame, complain and defend? Absolutely not. This week it may be true that I didn’t get my way. And, maybe, just maybe, I let myself fall below the line while I spent a few minutes (okay longer than that) on autopilot as I complained. But, I had to press pause and snap myself out of it. So, after I got my complaining out of my system, I decided to look at my new situation as a learning experience, an opportunity, a new challenge that would help me learn and grow. It’s not easy to keep this positive mindset. But, I know that I control the story I tell myself. I’m not going to live with a victim mentality. I’m going to embrace my challenges. I’m going to pick myself up and continue on the journey to ELITE. What will you do when you are challenged? What will you do when things don’t go your way? ​​When I was a little girl I was often referred to as “bossy”. I wanted things my way. I was assertive. I enjoyed having a plan and insisted that everyone followed it. I wanted to give orders using my microphone. As I grew up, I started to feel really bad about being called “bossy”. And, in elementary school I became very quiet, shy and unsure of myself. (Those of you who know me now are most certainly surprised to hear of this shy phase.) Looking back now, I know that being referred to as “bossy” made me feel unsure of myself. I didn’t want to be a “boss”. And, I certainly didn’t want to be called “bossy,” but deep within me was a desire to be a leader. Me, circa 1983. My first microphone. ​​It wasn’t until high school that the leader in me began to be cultivated. It happened naturally as I played sports and was part of various organizations and teams. But, even as I began to embrace my desire to lead, I still felt like a “boss” and I really didn’t like that. As I continued through college and then on to my teaching career I began to study the leaders around me. I learned lesson from them. Surprisingly, some of the most important lessons I learned came from the least effective leaders. I learned what leadership wasn’t. Only then, could I really begin to hone my own leadership skills. A few years into my teaching career, I was blessed to work with many inspirational leaders in Hilliard City School. These leaders helped me reflect on my skills, gave me constructive feedback and most importantly believed that I could be an inspirational leader. A few years ago, I was given the opportunity to lead an entire school! I didn’t think I was ready and it turns out we’re never really ready. I’m so glad that I accepted the challenge. It turns out that the best way to learn about leadership is to be one. Leadership isn’t a title-Anyone can be a leader. It doesn’t matter what title you hold. Leaders are all around us. Leaders inspire, listen, create, cause others to grow, ask questions, and make positive change. Leadership isn’t imparted on us by our title; leadership is within us. Leaders lead for others-When you are a true leader you know that what you do is not for you. You don’t lead so that you can be praised, rewarded, or put in the spotlight. You lead so you can impact the lives of those around you. Leaders are vulnerable-Leadership is not about being right. True leaders share their worries, their weakness, and their fears. They have no problem asking for help and accepting help. Leaders fail-Leadership is about taking risks, failing and learning. When you lead with the goal of making a true impact you have to be willing to fail along the way. It’s what you do in the face of failure that defines you. Leaders develop new leaders-Leaders set conditions for others to take on leadership roles. Leaders seek out those people in their organization who possess leadership skills and they help those people grow as leaders themselves. Leaders make others uncomfortable-Leaders have a way of pushing others out of their comfort zones. Then, they walk alongside their team and celebrate the journey. Leaders have tough conversations-Leaders don’t permit behavior that does not align with their culture. Leaders will hold their team accountable and will expect their team to hold one another accountable as well. Leaders are a safety net-Leaders make sure that their team knows that when they take a risk, there is no need to fear failure. Leaders create a safety net; a safe place to land when things don’t work as planned. Leaders don’t need to be needed-As a leader our goal is to create such a strong culture and set of expectations that no one needs you. That’s right-leaders need to be able to be away from their teams and know that the journey will continue. Leaders are part of the team-Leadership is not a hierarchy. Instead, leaders must be part of the team. As a leader it is crucial that you walk the walk with your team. I would never ask my teachers to do something that I wouldn’t do myself. And I would never do something that my teachers couldn’t do. That’s why I rarely heat up my lunch and I eat it in about 2 minutes flat. If my teachers don’t sit down for an extended time to eat lunch, then neither will I! What would you add to the list? I’d love to hear your leadership lessons. Have you ever bought something and then been told by the cashier that you’ve been selected to complete a survey about your customer service experience? I get these surveys on the bottoms of my receipts all the time. Though I rarely, if ever, complete them. Two weeks ago I purchased a new car. After spending what seemed like a lifetime at the car dealership negotiating a price that I hoped was reasonable, I was finally ready to sign mountains of paperwork. My salesman, Rick, shook my hand and said “It was great working with you today, in a few days you’ll get a survey and we ask that you answer each question by saying you’re completely satisfied.” I smiled and said, “Oh, okay.” Rick walked away to tell the finance department that I was ready to sign more paperwork. As I waited I couldn’t help by replay his words in my mind. “Answer each question saying you’re completely satisfied?” I was shocked, why would anyone ever tell someone what to mark on a survey? What does feedback mean to you? Sure, it’s great to receive positive feedback. But, whether the feedback we receive is positive or negative isn’t what matters. What really matters is what we do with the feedback. Do we just pretend like everyone is “completely satisfied” all the time? Or, do we accept honest feedback with an open mind and growth mindset? Do we want to grow or do we want to maintain the status quo? Accepting feedback, especially critical feedback, isn’t always easy. When we are open to feedback we have to be prepared to make changes, do more work and accept that our ideas are not perfect. But, think about what things would be like if we simply asked everyone to tell us they were “completely satisfied”. Where would we be personally and professionally? What opportunities would we have missed? On our journey to ELITE, feedback is crucial. We don’t ever really want to be satisfied or even “completely satisfied”. Instead we want to constantly be moving forward. 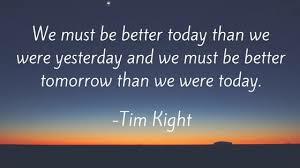 As Tim Kight says, "We must strive to be better today than we were yesterday and we must be better tomorrow than we were today." The feedback we receive along the way is what will continue to propel us forward. I heard this quote for the first time a few years ago. After hearing it, I began to think about the people with whom I spend time. I reflected on how those people make me feel. I quickly recognized the people who make me a better person, teach me new things, push me to reflect, inspire me to be better and help me grow. I created a list in my head of people who help me bring up my average and also started to recognize those people who bring down my average. Most importantly, however, I reflected on myself. I started to think about whether or not my words and my actions were adding value to others? I definitely don’t want to be a person who would bring down the average of someone else! 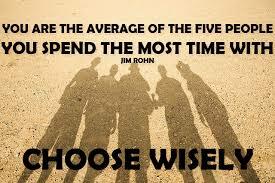 The theory of being the average of the five people you spend the most time with directly connects to the values we embrace in our school district. In Hilliard City Schools, we are immersed in R Factor training. One of the principles of R Factor is the concept of no BCD. BCD stands for Blame, Complain and Defend. In a recent blog post, Tim Kight explains that BCD “afflicts millions of people every day, and is often triggered by work stress.” This time of year brings about a lot of stressors-testing, end of year assessing, data team meetings, IEP meetings, moving grade levels, new initiatives, and more. So now more than ever, we need to reflect on our own mindsets, words and actions. We can all fall into the habit of BCD. BCD makes things worse. When we BCD we bring down the average of those around us. I challenge us all to think before we BCD. We control our self-talk and we control the story we tell ourselves. As we continue on our journey to ELITE we must surround ourselves with people who raise our average. Take a moment to think about the five people who you spend the most time with at school, at home, at the gym, etc. What do these people do to your average? Are these people habitual BCDers? Now think about yourself. Do you inspire others? What do you do when you’re stressed? Are you raising or lowering averages? To read Tim Kight’s blog that was referenced in this post, click here. 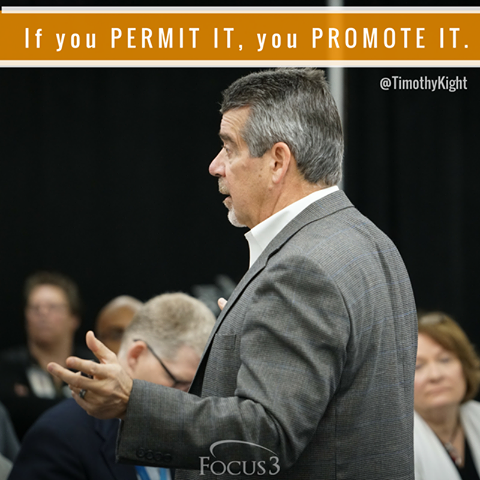 ​“If you permit it, you promote it.” Focus3 posted this quote and picture on their Facebook page earlier in the week. After I read the quote, I found myself reflecting on the words and the things that I permit. There are many things that I permit that I’m happy to also promote. I permit risk taking, failing, dreaming big, and not asking permission to try new things. I permit teachers to step up as leaders, as well as collaboration and innovative thinking among other things. It is my pleasure to promote these things. It would be easy to simply pat myself on the back for permitting such a culture, but instead I have forced myself to reflect on the things that I permit that I may not be so proud to promote. Often times as leaders, colleagues and friends we let certain things go because we don’t want to ruffle feathers, rock boats or make others feel uncomfortable. But, deep down we all know that there are things we’re permitting that we shouldn’t be promoting. I encourage you to join me in the process of truly and honestly reflecting on the things you permit. I ask you to think about the things that occur in your classroom or school that bother you. What do you do when you’re faced with things that make you feel uncomfortable? Do you do nothing and permit it to occur therefore promoting it? Or, do you step up and address it? On our journey to be ELITE we must remember that when we see things in our culture that are out of alignment we must not permit it. We must step up and do something about it. If we permit it, we promote it.